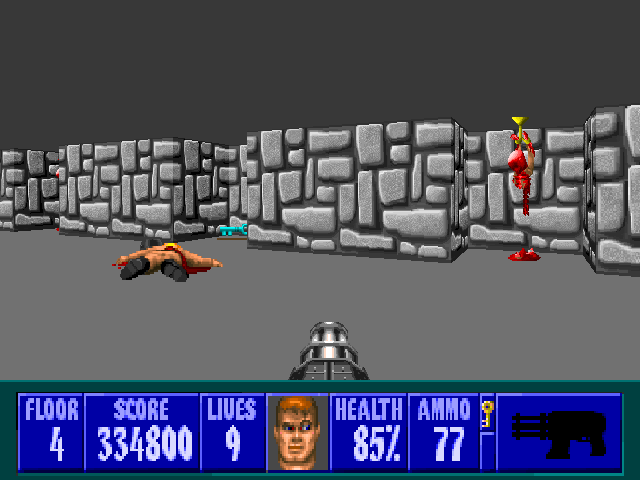 A more or less definitive hi-res patch replacing every wall, enemy, item and weapon with HD counterparts along with assorted sound effects from the Atari Jaguar, Macintosh and Apple IIGS ports of the game. Last edited by CeeJay on Tue Mar 21, 2017 8:19, edited 18 times in total. Very nice. Did you make any of these yourself? Some of them I don't recognize. EDIT - All the sprites you're missing seem to be in the Wolfers for Wolfers download on Wolf3D Dome. If you are referring to the wall/sprites then no, not really. A lot, and I do mean a lot, of them have been edited by myself though. It's a collection of stuff I've gathered over the years. I'm guessing you don't have a good way to get enemy sprites that aren't only front-facing. 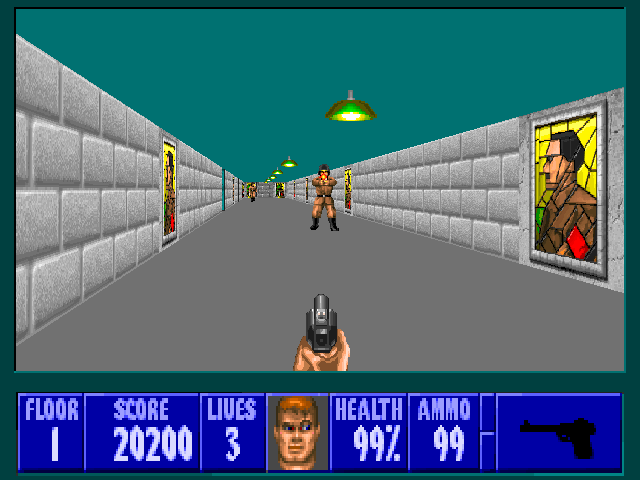 Also, that HUD face is a lot nicer than the vanilla DOS one, without looking too different from the rest of the DOS art. 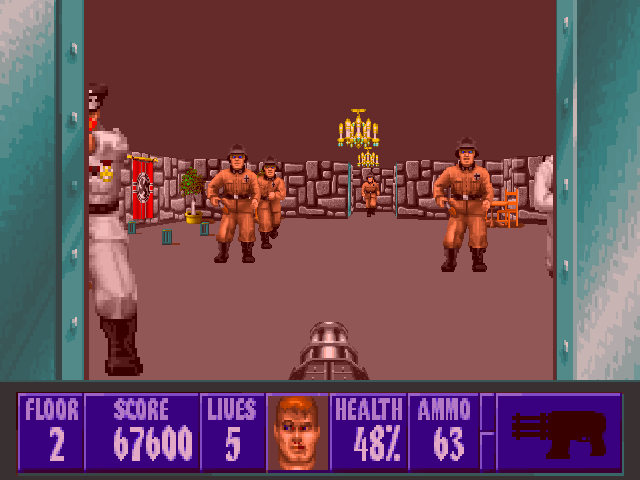 NeuralStunner wrote: I'm guessing you don't have a good way to get enemy sprites that aren't only front-facing. Next release will feature a ton of new and improved wall textures. They have also been changed to their original ECWolf names, no more WALL####. Makes things a lot easier and probably increases compatibility. 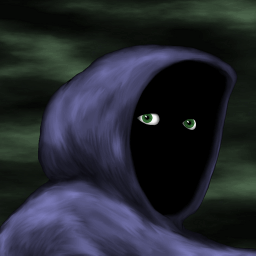 However, I am currently unable to start ECWolf (damn Vista) so it might get released blindly. Stay tuned. Noob question here. How do I actually install these patches so I can use them in ECWolf? The simplest method is probably to put them in the same folder as ECWolf and then start the game by drag-and-dropping them onto the ECWolf executable. Otherwise, all the methods explained here probably apply, just replace "ZDoom" with "ECWolf". Thanks, these packs are awesome. If only now I could at the 3DO version soundtrack to the mix. If you have the audio files it's not all that hard. All you have to do is rename each respective file to its lump name (such as GETTHEM. *** or XEVIL. ***) and then slap em into a .pk3 or .wad file. Only restriction is that it must be an audio format that is supported by ECWolf. Refer to ***MAP. txt in ecwolf.pk3 for the lump names. Thank you very much CeeJay, this pack makes the game look so much better! It's just a bit weird that the enemies look a bit stretched up compared to the original, is there a way to fix it? uVSthem wrote: Noob question here. How do I actually install these patches so I can use them in ECWolf? I was surprised ecwolf shares some commands with zdoom, I tried it blindly and it worked! Nice idea there from the creator (Blzut3 I think?). Sorry for the double post but could you separate the enemies from the textures in two different files? I just found out that you can't take the enemies by surprise because there's no sprite rotation and they are always looking in the player direction. (I figure it's way more work to do the sprite rotations from the ground up than to simply remove them altogether, and I prefer to not have them instead of changing gameplay this way). I just need to delete decorate.txt? edit 1: nope, didn't work. Edit 2: Found a temporary workaround by removing these specific actors and their sprites. New version is coming, which will feature enemy rotations and tons of new and improved sprites along with a Mac-inspired HD status bar by DenisBelmondo.